Lets go back to March for a new addition to my collection. File this one after Flavor Unit’s “Roll Wit Tha Flava”. Mad Kap has a place in hip-hop history next to groups like Yaggfu Front and Rumpletilskinz. Groups that came in the game and were finished faster than a fifteen year old boy getting his rocks off for the first time. 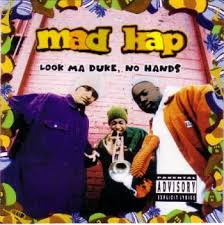 Mad Kap was the Los Angeles based trio consisting of Coke, Motif and Dr. Soose (who rapped and played the trumpet). The group was one of the earliest acts signed to Loud Records (which would later be the label home to such artists as The Wu-Tang Clan, Mobb Deep, Big-Pun and Dead Prez, to name a few) and released their only album to date, Look Ma Duke, No Hands , completely produced by a cat named Broadway. When I saw this album sitting in the used bins a few weeks ago, the cover art looked vaguely familiar, but after reading the liner notes I still didn’t recognize any of the songs on the track listing. Then when I saw it was on Loud Records, it featured guest appearances from a few hip-hop artist I like, and the price was right, I thought why not give it a shot. After all, it is nineties hip-hop. Maybe it’s a hidden gem. There’s nothing wrong with being optimistic. Here Come The Breaks – The first actual song of the evening doesn’t make a great first impression of Mad Kap. Over a boring Broadway backdrop (tongue twister much), Coke, Motif and Dr. Soose (who they also refer to as Joe at different points on Look Ma Duke )match its energy with dull rhymes. Hopefully this is not a prelude of what is to come for the rest of Look Ma Duke . Da Whole Kit & Kaboodle – Broadway’s instrumental makes strides in the right direction. Unfortunately, Coke, Motif and Soose don’t, and Dr. Soose’s trumpet play is insignificant. Irrelevant – An adjective that also describes this song. When It Rains It Pours – Coke and Motif use this one to get conscious. Coke uses his verse to narrate the life of a young kid and the events that lead to him becoming a drug dealer, while Motif uses his verse to share the story of a girl who becomes a teen mom. The fellas have good intentions, but their verses ring hollow and don’t sound genuine. And once again, Dr. Soose’s trumpet play adds nothing beneficial to the song. Broadway’s track is forgettable too. Cheeba – Dr. Soose trumpet solo interlude. Check It Out – Mad Kap invites Ahlee Rocksta and Likwit crew members, King Tee and Tash (from the Alkaholiks), to join them on this cipher joint. It was nice to hear from King Tee and Tash, as they inject such much needy quality emceeing into Look Ma Duke. Unfortunately, Broadway’s instrumental doesn’t do much to accentuate their quality bars. Oh Phuck Me Right? – This was a strange interlude. Phuck What Ya Heard – Broadway slides Mad Kap a funky backdrop, and they invite Daddy Freddy to add a reggae chant in between their verses and at the end of the song, which adds some much appreciated flavor (even though I have no idea what he’s saying). Mad Kap brings nothing lyrically substantial to the table, but the instrumental will keep you bobbing your head. Thoughts On The Indoe From Joe – Dr. Soose spits a short freestyle rapping praises to his favorite strand of smoke. The indoe. Proof Is In The Puddin’ – Broadway builds this backdrop around a smooth loop from Gene Harris’ “Feeling You, Feeling Me, Too”, and is easily his best instrumental on Look Ma Duke . And Dr. Soose’s trumpet play actually adds something to the song, for once. Jeff-Self – Followed by another interlude, which features Broadway’s little brother going on a potty mouthed rant. Beddie-Bye – Tash got a chance to rock it on “Check It Out”, so it’s only right that his fellow Alkaholik brethren, J-Ro and E-Swift, get an invitation to join Mad Kap on this one. Needless to say, they both out rap their hosts (MOYOS). Initially, I wasn’t feeling this one, but after a few listens it grew on me. Dopest Verse – After listening to Capital Tax’s posse cut “Treetop Connection” last week, I thought I’d never hear a more boring and underwhelming posse joint again. Then I heard this song, and my theory was destroyed. Coke, Motif and Dr. Soose invite LaQuan, L.Dub and Broadway (who fires a shot at east coast hip-hop on the final bar of the song) to help them create arguably the worst posse cut in the history of hip-hop. No exaggeration. This song is horrible. Coke, Motif and Dr. Soose, collectively, do not have the charisma or lyrical prowess to carry an entire album, which becomes crystal clear after one listen to Look Ma Duke . The album’s producer, Broadway, has a few shining moments on the production side, but not enough to overshadow Mad Kap’s impotent emceeing (and by the way, Dr. Soose’s trumpet play adds very little sonically to Look Ma Duke ). But look at the bright side: the album is technically only nine songs long, so you don’t have to waste invest too much of your time to give it a listen. I first heard Mad Kap on King Tee’s Tha Trifilin Album. I bought this on the strength of that and boy was I disappointed in this garbage. I tried to get into this album but I gave up after several listens. I thought the dude with the trumpet was just stupid. Mad Kap is one of those acts that 93 hip hop lovers always romanticize. I see now why Loud dropped them after this album.